A great show to kick off the latest series of Live and Loud! Until 2014, Kate Bush hadn't toured since her Tour of Life in 1979. So why not find a show from that tour, polish it up and bring it to you? 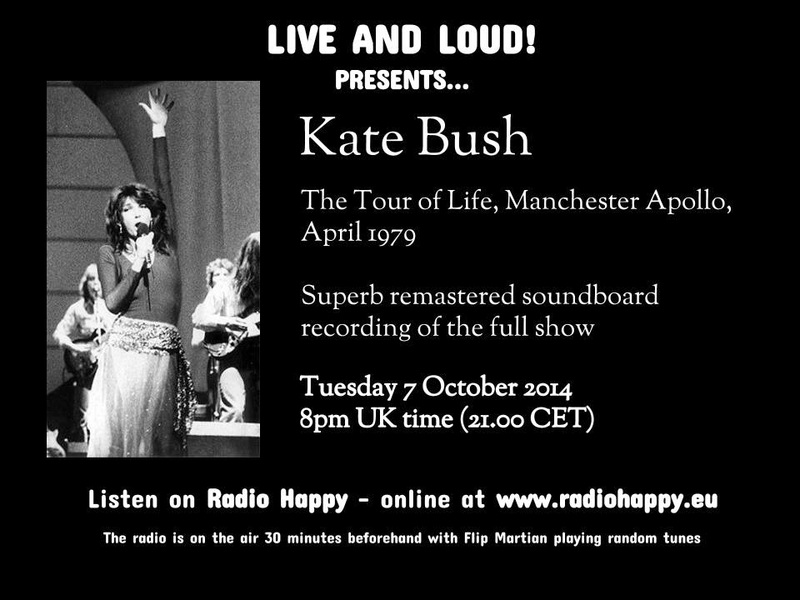 This show takes you back to 1 of the Manchester Apollo dates on that tour in April 1979. The tour was a lavish affair, featuring multiple costume changes, poetry, magicians and back projections - none of which we can bring you of course! But what we CAN bring you is a polished up and (apart from a few brief parts where the tape was degraded) great sounding soundboard recording. This is the full show, running to nearly 2 hours a great set of songs which has cleaned up nicely - I hope you enjoy it. This was originally stored on mixcloud HERE, where it could be streamed at any time. Excellent stuff. Seeing Ms Bush back then was a sight to make grown men weep. Really nice job of putting this up for us. Many thanks.